DJ Marty understands how important your event is to you, and it's success is my number one priority. DJ Marty is equipped with the personality, professional equipment, and extensive experience to create an atmosphere of fun and excitement. You and your guests will have many wonderful moments to remember from your event. Clearwater Beach FL DJs, Hudson Beach FL DJs, Hernando Beach FL DJs, St. Pete Beach FL DJs, Belleair Beach FL DJs, West Central Florida DJs & the surrounding Tampa Bay Florida areas as a DJ since 1999. In addition to the latest in professional sound equipment, DJ Marty offers Karaoke, Music videos, Props, Gobo light, Intelligent lighting, LED lighting, Up-lighting, Laser lights, Fog and Bubble machines too. If you book me -- DJ Marty is the one that will DJ, Emcee & entertains at your event. DJ Marty does not subcontract. 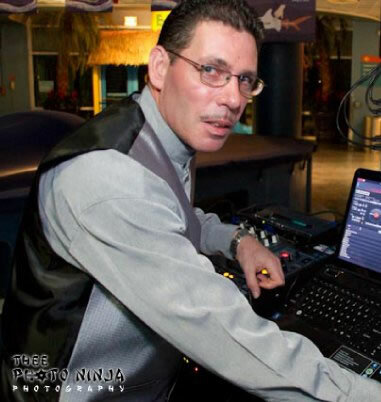 DJ Marty is a professional full time licensed & insured Disc Jockey in the state of Florida. DJ Marty now has close to a quarter of a million songs available. I use CDs and digital files so that all my clients enjoy the ultimate sound quality and reliability. Click here for music selections available from the 1940's to current hits including Latin & Christian music. I also offer many other ethnic selections. I have been a professional full time disc jockey Serving Clearwater Beach FL, Hudson Beach FL, Hernando Beach FL, St. Pete Beach FL, Belleair Beach FL DJs, West Central Florida & the surrounding Tampa Bay Florida areas as a DJ since 1999. I worked with several bands in the contemporary and salsa genres. I have extensive references in the West Central Florida area, as well as many happy clients. Click here for happy client testimonials I offer friendly professional services. Click here for reasonable prices. My friendly professional service, and top of the line professional equipment & lighting. Click here to veiw my equipment to assure the success of any occasion you may hire me & use my services.